I prepared this small map for Jeff to play through as his character fled the prison into the sewers beneath the city of Theogonia. It was small dungeon designed for him to meet a few monsters, blocked passage ways, and some chances to acquire at least some limited supplies. There were Gray Oozes roaming the halls, collapsed tunnels, passages blocked by rusted steel doors, waterfalss he had to scale, and of course a mysterious whirl pool leading to the god's know where. 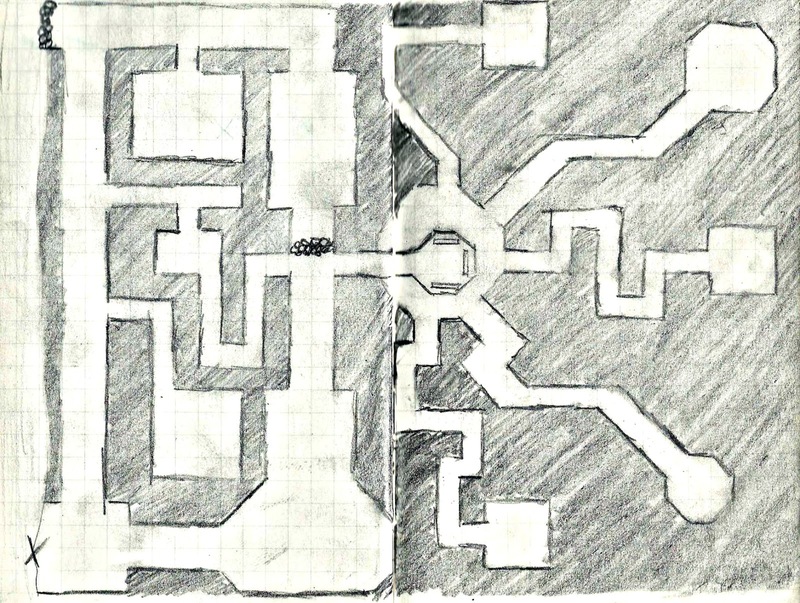 All of this was leading him towards the centre of the map where he and his prison mate Thaddeus found an abandoned control centre they decided to use a base. Had I had paid attention to how low Jeff's character Godfirc's HP was, I would have toned down the difficulty a bit, but he managed to survive. So it couldn't have been all bad.